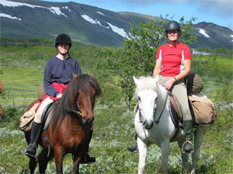 Join us for a fantastic horseback riding adventure including a tour along our national river; Vindelälven (or the river Vindel´n), one of the last free rivers in Sweden. We spend the night in an old poineer's place "Aitelnas viste" a jewel amongst jewels. The day after, if the water level allows, we wade across the river (on horseback), an exciting experience that many appreciate ..... at least afterwards! From the top of the mountain Ammar you can see the infinite space in all directions. If we are lucky we can see a buzzard or a golden eagle soars in the sky and maybee we hear the laughter of the ptarmigan. We arrive back to Ammarnas about 5 pm and enjoy a waiting hot tub on Hedebo farm. You spend the night at Hedebo farm. Arrivel to the village Ammarnäs in the afternoon/evening. You spend the night at Hedebo farm. Breakfast in the cottage. At 9:30 am we travel to the village for a visit at the Ammarnäs Visitor Centre, where we are guided around the exhibition between 10-11. After the visit we start with a ride; extended half day riding-tour, riding along a creek up to an old settlers place. Hay meadows with its barns have been restored. Canter along these meadows is a delightful experience. On the way back we wade across the creek (if water level allows). We conclude with riding horses home to Hedebo farm. You spend the night at Hedebo farm in assigned cottage. Breakfast (prepare on one's own) and lunch are included in basic price. Breakfast in the cottage and packing of the personal equipment. 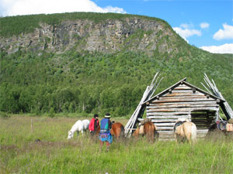 At 09.30 am we start with the horses and the riding-tour against the old pioneer place; Aitelnas viste, a very old cabin from 1880s. Aitelnas viste lies in the mountain valley, very beautiful under the steep slope of the mountain hillside and along the shore of the river vindel´n.The fine sandy beaches welcomes you to try a dip in the crystal clear, shimmering green but cold mountain water. Breakfast (prepare on one's own), lunch and dinner are included in the basic price. 17 km / 3 ½ hours in the saddle. We start early in the morning. 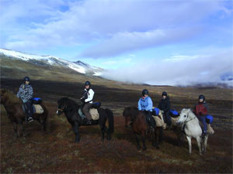 The day includes wading on horseback across the river Vindel´n, an exciting experience that, perhaps, makes it tickles in your stomach, we climb up to Stuore Jåppen and maybee 1 or 2 canters across the expanses. After the ride it feels good with a warm hot tub at Hedebo farm and an last-dinner-meal. You spend the night at Hedebo farm. Breakfast, lunch and dinner are included in the basic price. Departures Wild at heart 1 "Ride the free river of Vindel´n"
* Able to gallop or at least think you are. * Mini: 2 and maximum 4 participants on the tour. * Able to saddle, groom etc. Basic price "Free river of Vindel´n" : 6.950 SEK / person incl. - Breakfast (4), Lunch (3), Dinner (2) Note!